If you’ve read a few of my “recipes” you have probably figured out one of my go-to meals is ground turkey. It is so easy to cook with and to make into almost anything, using any flavor. I cook it with whatever vegetable I have around or new one I want to experiment with. I usually start by sauteing an onion then I add food accordingly. 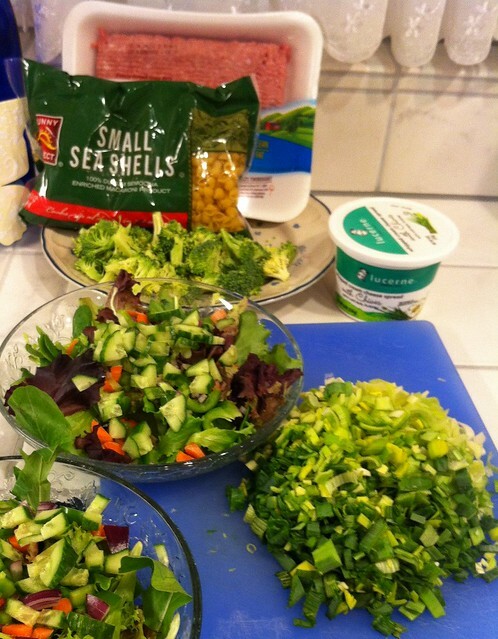 I find that most of the time I need to cook at least one of the veggies first. I feel some vegetables need to be cooked more than turkey, like mushrooms. But broccoli is one that gets added when the turkey is almost cooked. My latest veggie to add to my turkey is a leek. I was in Campbell this weekend signing the studio contract where I am going to have my new evening Nia Class and the city of Campbell has a great farmer’s market. While I was walking down the aisle I saw leeks and I thought, “I should add that to the turkey.” So I bought one. I have never cooked with a leek before. I was thinking I would saute a little bit of onion then put the leek in then saute it then add the turkey. But when I chopped up the leek it smelled so onion-y I decided I didn’t need to use an onion. I mean leeks do belong to the same family as onion and garlic. After cooking the turkey until it was almost done, I added some broccoli. When the broccoli was almost done I added a couple of tablespoons of whipped cream cheese with chives. The leeks have such a great flavor I loved them. I am going to cook with them more often. According to WHFoods vegetables in the same family as leeks, such as onions and garlic supply their nutrients better if they sit for about 5 minutes after cutting before cooking. Furthermore since they all belong to the same family leeks have many of the same health benefits. Leeks have a lot (over 50% of the daily value) vitamin K. They also have a large quantity of vitamin A. They contain vitamin B1 (thiamine), vitamin B2 (riboflavin), vitamin B3 (niacin), vitamin B5 (pantothenic acid), vitamin B6 (pyridoxine), and vitamin B9 (folic acid). They also have a flavanoid shown in research to help protect our blood vessel linings from damage. Leeks also contain compouds that convert to allicin and this has been shown to help relax blood vessels by producing of nitric oxide (NO). With all this good stuff they do for our blood vessels it seems logical they will add to cardiovascular health. Since leeks are so onion-y for me it will be easy to include them in our diet either cooked right into our food to add an additional layer of flavor and nutrition or even chopped and raw. We can add them to our kale salads or throw them in with our quinoa. I am definitely going to add them in my soups. I think the more vegetables I add to our soups the better. I really was impressed with the flavor that the leeks add to this dish. I thought they were amazing! Do you include leeks in your diet? How? Do you cook them? Do you eat them raw? 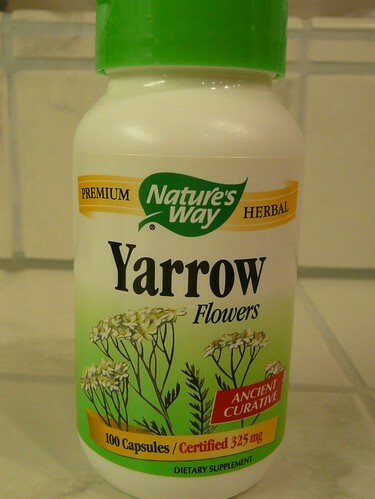 I once mentioned to a friend that I had a cough or some congestion in my lungs/chest, she suggested I take yarrow. She had said that it aides in lung health. When I looked it up, I remember finding information supporting that, but that was some time ago. I bought a bottle of capsules and took them on and off until they were gone. When I tried to find it again I had a difficult time finding it. It took me a long time to find another bottle. I think this all happened over a period of two or three years. So now here I am thinking I could post about it and the information I am finding on the internet is vast and interesting. As with any supplement you are thinking about taking you should talk to your doctor so s/he can advise you of any adverse side effects that might occur when mixed with any medication you are currently taking. As I look at the information out there today I cannot find but one thing that says it helps with “upper respiratory phlegm”, but not more about lung health. There is a lot of information that says it helps with a lot of things that could be associated with lung health. It actually looks as if this herb does everything. I see that it is used as an antiseptic and an astringent. Information states that it aides in digestion and is used to treat inflammation. It is used to treat colds, flu, and hay fever. Since it is used as an anti-inflammatory then it makes sense that it would be a good thing to use if you have a cold, flu, or hay fever because inflammation is a symptom of those ailments. 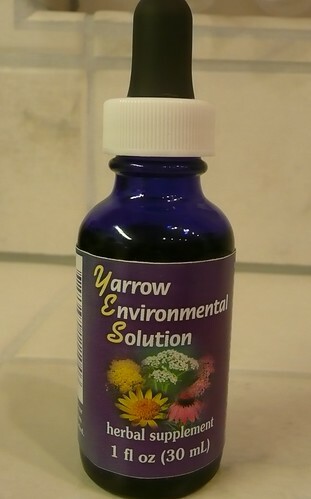 Yarrow contains flavanoids which are linked to antioxidants. It is used to help with muscle spasms, gas (both preventive and expulsion), and over production of sweat. As with most herbs there are several ways to use or take Yarrow. I myself have capsules and a liquid. There are oils and teas and compounds that can be applied topically. I think that some of the things that yarrow is stated to help might actually need medical attention so even though this herb sounds great be cautious and don’t necessarily substitute medical attention with an herb. For me, even though herbs have side effects and we cannot always be certain of the purity of our herbs, I personally believe that herbs are a good thing to take as a supplement to a healthy diet. What do you think about herbal supplements?